Painted Circus P.t. Vermin Presents a Mesmerizing Menagerie of Trickery and Illusion Guaranteed to Beguile and Bamboozle the Beholder! 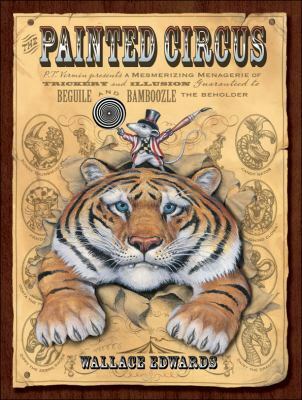 The weird and wonderful artistry of award-winner Wallace Edwards brings you The Painted Circus, a showstopper of a book where the eye is tricked, bamboozled, hoodwinked and flimflammed ... but finally rewarded when all mysteries are revealed after the grand finale! P.T. Vermin, ringmouse extraordinaire, ushers patrons into the Big Top to behold 22 astonishing stunts, including Norwegian Marching Ducks, the Spectral Sphere and the Flying Fishtastics, each featuring an eye-opening optical illusion. It's all here -- fabulous phenomena, impossible objects, moving patterns, visual distortions and topsy-turvy geometric illusions! Each page encourages kids to get into the act by solving the visual puzzles in every image -- and they will delight in spinning, flipping, tilting and making funny faces at the book as they do so. Entertainment for the whole family, Wallace Edwards's tour de force is a work of art that will leave readers spellbound by the power of perception and the magic of imagination.Edwards, Wallace is the author of 'Painted Circus P.t. Vermin Presents a Mesmerizing Menagerie of Trickery and Illusion Guaranteed to Beguile and Bamboozle the Beholder! ', published 2007 under ISBN 9781553377207 and ISBN 1553377206.